Those who know me know that I am willing to try almost anything once, especially if it involves skin care (ok, and hats, shoes, food or wine). This holds especially true when trialing new skin care products, fillers, injections, or lasers. If I am not willing to do it or do not love the results, why would my clients? 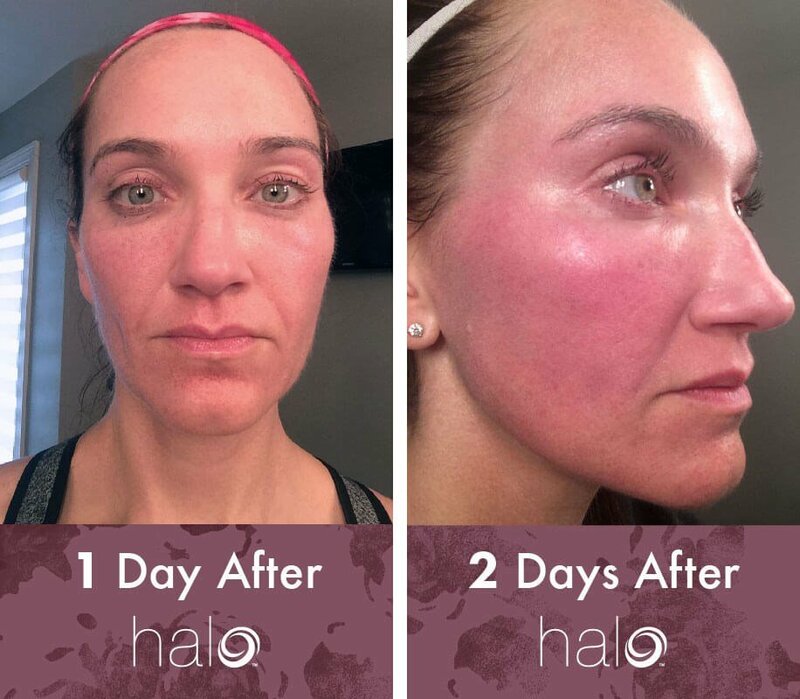 Well, I did it… I experienced a new glow with HALO!! Since I first heard about HALO as a laser skin treatment nine months ago, I have desired to try it – and now it is ours to be had at Artisan 57! It is a laser treatment to be reckoned with for skin rejuvenation with minimized downtime. And when I say “downtime” – I mean the time you feel like you have to hide yourself in your home and not be seen in public. In my own experience with the procedure, there is still healing time – the time where your skin changes and responds to the laser with some swelling, redness, and dryness – but there was never a time I did not feel comfortable in my day to day role. I didn't feel like I looked so scary that I couldn't go to the grocery store or even to work. HALO is a treatment designed to give maximal skin treatment/resurfacing/collagen renewal/rejuvenation while minimizing the sometimes intense downtime that can occur with other current laser treatments. The other treatments work – and will work well! – but the initial downtime can be a put-off for some clients. With HALO, I hope that no one feels they cannot experience the benefits of laser due to not having the downtime. The day of the treatment, we numbed the areas that I wanted to treat with a topical numbing for about one hour. Areas I wanted to treat included my face, neck, back of my hands to my wrists, and the top of my knees – that skin above them that gets wrinkly and saggy. J My treatment parameters were set for a “moderate” or average treatment. I don't have many wrinkles, but do have increasing laxity (hey – I am getting older! ), as well as melasma and, in general, I simply desire to keep my skin as healthy as it can be. And…it didn't really hurt…but it was very warm. Like a sunburn and multiple tiny, little, baby pin-pricks. Not painful – but noticeable. As the treatment continued, the heat increased also. I would say that the heat was the definite difference between the HALO and our other favorite treatment at Artisan for rejuvenation, the Signature 57. The heat lasted for about one hour, and I kept spraying myself with cooling thermal water spray when I felt it got intense. This really helped. The sensation feels similar to when you eat really spicy food and desire cold water constantly to help take the “heat” away from your tongue. Interestingly, I went out for dinner that very eve, and I truly doubt that my friends knew I had experienced a treatment that afternoon. Not something that could be said after our traditional treatments. The second day brought increased swelling. (In order to help keep the swelling under control, I took a low-dose oral steroid twice a day.) The MENDs (microscopic epithelial necrotic debris) didn’t really start appearing until later on this day. The MENDs look like pinpoint dark pigmented areas and correspond to the tissues affected by the laser starting to reach the surface because your body is trying to get rid of them. They feel a little like sandpaper and as the days went on; they actually became more prominent and a little rougher in texture. I loved seeing them, actually – they were carrying away some of my pigmentation, and, in their place, growing new collagen! On days three and four, I continued to have noticeable MENDS, but my swelling decreased. At no time was I uncomfortable, but my face did feel dry – even with putting on continued lotions. About day four, I began using a slightly thicker skin lotion, as I felt I needed the moisture. I also had a few breakouts, especially on my chin. I REALLY wanted to used my Clarisonic to just “get the MENDS off!” – but I knew it would not help and could only cause irritation to my skin, so I simply continued washing my skin two to three times a day with a gentle cleanser, and frequently applying lotion. By about the fifth or sixth day, the MENDs were gone, and I would have been able to begin applying make-up to my skin. However, I was too in love with my glow. I opted not to wear anything to cover it up. Would I do it again? Without a doubt. Healing time for the entire “process” was not much different than other traditional laser resurfacing, but I didn’t have to plan to stay in my house all weekend for the initial healing phase. I do not have that kind of free time for downtime, and many of our clients don’t either.